The latest trend in crafting seems to be flip books. I am not a mini album maker so these were a bit intimidating to me, but I wanted to make something for a crafty friend (YT: Linda Lapotka) who has recently been going through some family tragedies. I wanted to make something for her that I hoped would lift her spirits a bit and let her know that I was thinking of her. 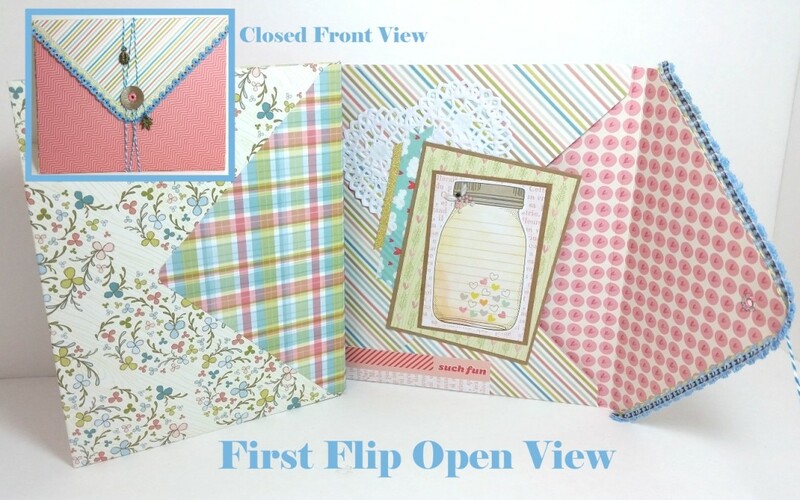 To make this 6″ x 8″ envelope flip book structure, I used a We R Memory Keepers envelope punch board tool and four sheets of 12″ x 12″ double sided paper (cut down to 11″ x 11″, with scraps used later) from the Heidi Grace Daydream collection. The bright Easter-like pastel colors made for a sweet backdrop for the decorations and pictures of her granddaughter and cat that I pulled from Linda’s YT channel and blog. I used paper heart doilies, pearl butterfly stickers, a lacy heart sticker, pink Stickles, gold glitter washi, sunglasses washi (to go with Linda’s granddaughter’s sunglasses), and clouds and heart washi with various cut apart pages from the American Crafts Dear Lizzy Neopolitan paper stack. I also tucked four altered paper clips that I had decorated with owl images that I Copic colored from the Lawn Fawn “Mom + Me” stamp set (Copic colors used: Dad: E11, 21, 23, 25, 29 with hint of B91 in face; Mom: E21, 11, 97, 99 with hint of B91 in face; Kids: B91, 93, 95, 97 with hint of E21 in faces and bellies). I had so much fun decorating up these pages. The page I feel most proud of was the page on which I pieced together a background/pocket made entirely of little scraps (I can’t tell you how great it felt to use up so many bits and bobs!). I loved the Primitive style patchwork look of this background. 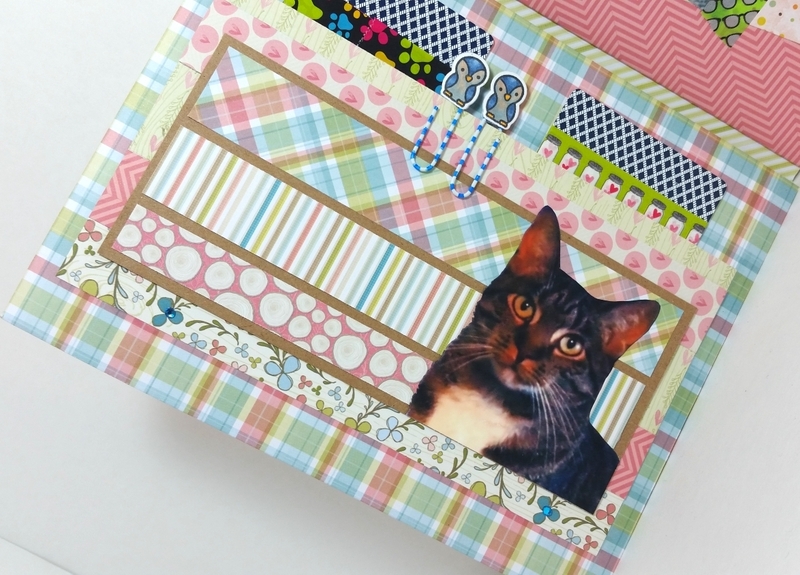 Plus I kept the top of this background overlay open in order to create a slim pocket into which I could slide a couple of playing cards with washi samples on it as a little gift for Linda. Great idea! I love the colours and patterns! It’s so functional! Thank you for playing with us at Card mania challenge! WOW, what a fabulous book you have created! Another beautiful handmade treasure! Thanks so much for sharing your lovely work with us this month at Paper Sweeties! The colors in the DP are soft and sweet. 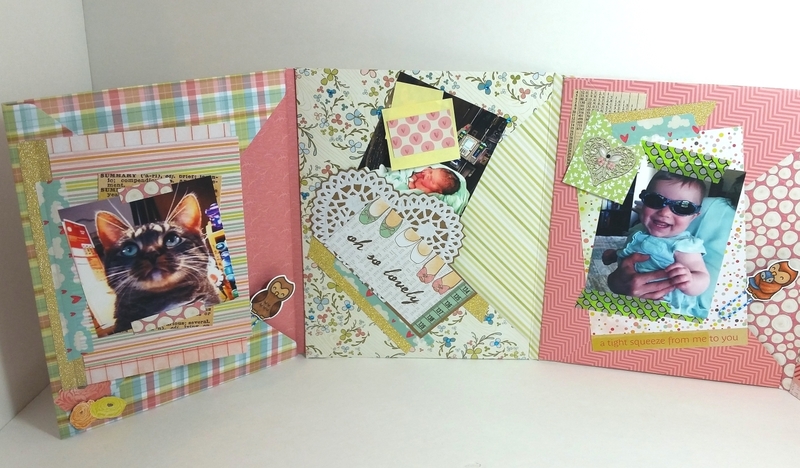 It is a very clever way to to make a little album/flip book, it’s also rewarding to use scraps. Thank you so much for entering our 221st challenge. We are always delighted to see your entries and appreciate your inspirational creativity. This is such a sweet project. Thank you so much Lisa! It was really fun to make too! Nice! It’s really an amazing project! Maybe it’s first but anyway – very nice. I like the soft colors. Great idea with the envelopes. Thank you for joining Simon Monday Challenge this wek. Oh, That is a super cute envelope book! I love the colors and that is a cool closure. I like the little leaves you added to it. This is sure to cheer anyone’s day. What a super fun project! It’s fantastic! Thank you for playing along with us at LPOCF!